The reference standard integrates the following key elements, internationally recognized, in order to assure the safety of food along the food chain, to the final consumption point: the interactive communication, the system management, the HACCP principles, preliminary programmes. 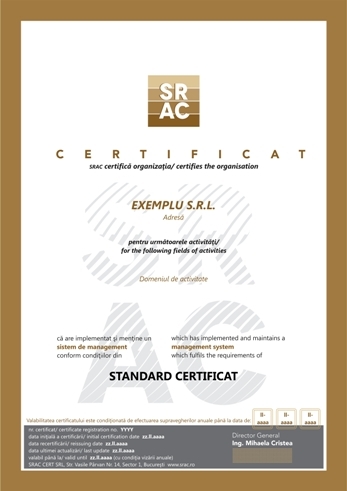 are regularly informed on the evolutions in the food safety and certification areas, by accessing SRAC website, events organized by SRAC. The companies involved in the production, packaging, supply and sale of food products have to make sure that the safety of these products has not been compromised within the food chain and this can be achieved by the implementation and certification of a food safety management system.